These days it seems that you can get anything you want delivered to your home. From one-click ordering on Amazon to groceries and even apps that call a taxi for you, we’re all very keen to get the world to move around us, aren’t we? There’s certainly nothing wrong with a bit of convenience. We’ve been helping to add some convenience to people’s lives in Reading for some time now by doing the job many hate or just don’t have time for – the laundry! From ironing to dry cleaning and laundry we give you a much-needed helping hand to keep your home and life in order. We’re often asked whether we collect and deliver the laundry too and you might be surprised to know that we do (given the right conditions). Avoiding the terrible Reading traffic! Reading is notoriously bad for traffic, and parking can beat a premium. 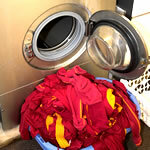 Us collecting and delivering your laundry is not only convenient, but it will probably save you a lot of time too. We found that most customers can only collect during the busy time and that can be really tricky on the roads around Reading so we deliver and collect for you in the quieter times while you’re busy or at work! Parking can be tricky too. If you are coming into Reading to deliver or collect or even just for some shopping then you might find this list of local parking areas and car parks useful. Collection and delivery – how do you qualify? Our collection and delivery service is very popular but obviously there are a few caveats on the service to make it viable for us as a small business. Driving miles to collect one shirt wouldn’t be a sound business model as we’re sure you can appreciate. As much as we love to help everyone, we need to make sure we stay in business so we can continue to help our customers for years to come. 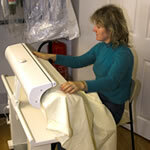 To qualify for free collection and delivery there is a minimum order of 6kgs of ironing (£29.75). We can be flexible and the order can be made up with ironing, laundry, and dry cleaning so long as the order is of a minimum £29.75in value. You can still get collection and delivery service for smaller orders, but the charge will be the minimum charge of £29.75. 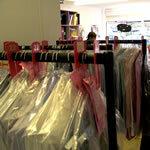 When can we deliver and collect your laundry in Reading and surrounding areas? Reading is notoriously bad for traffic so we tend to avoid the really busy periods like rush hour, Friday afternoons, Friday evenings, and weekends. The rest of the week we have certain days for certain areas, which we’ve listed below. We collect in Henley-on-Thames and surrounding villages onMonday mornings and then work in Burgh field in the afternoon. Delivered back: Middle of the day on Tuesday. At 6.30am on Tuesdays our driver leaves the shop to cover Spencer’s Wood, Arborfield, Wokingham, Winnersh, Shinfield, and Earley. On Wednesday our driver leaves at 8am to collect from Pangbourne, Whitchurch, Basildon, Aldworth, and the villages west of our shop. Delivered back: Wednesday afternoons or Thursday. We also collect and deliver daily in Caversham and Tilehurst. Our turnaround is a guaranteed for 24 hours (iron only), but obviously laundry may take longer, especially if items can’t be tumble dried. When can’t you collect or deliver? We love to help wherever we can but there’s a cut-off point where we’ve simply left for your area so please do give plenty of time to help us help you. Phoning after 5pm on a Monday to get on the list for Tuesday am is too late for us to be able to help, unfortunately. To arrange a collection or delivery please give us a call now on 0118 942 2200 and we’ll be delighted to help you. The Ironing Lady – Let us do the hard work for you, freeing up your time to do what you want!